Fear not, lovers of raw, passionate, bare-bones music. Ramblin’ bluesman Seasick Steve is back with a great new batch of songs and stories for anyone who’ll listen. His new album, You Can’t Teach An Old Dog New Tricks, is an unpolished, no-frills joyride of swampy electric rockers and back porch ballads that is sure to leave you with a smile on your face. Pulling inspiration from his rough and tumble days of hopping the rails and working the fields, Seasick Steve’s songs are as down to earth as they come. Like anyone who has chosen to live life on the fringes, his outlook is a mix of hard worn wisdom, retrospective regret and the unwavering pursuit of a good time. But regardless of the topic, each song is laid out with the same signature, no-pretense playing and his sly-dog delivery. Steve’s “guitarsenal” of one-of-kind, handmade instruments includes a one-string guitar played with a screwdriver slide, a three-string guitar tuned in whole step intervals and a four-string guitar whose body is made out of hubcaps. He also often accompanies himself on the “Mississippi Drum Machine,” a wooden box he plays with his foot. But don’t let the smooth taste fool you! 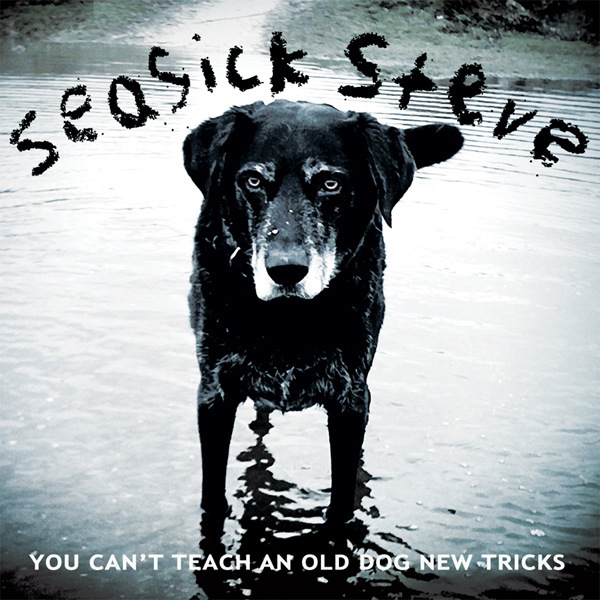 Seasick Steve will absolutely blow your mind with the sound he creates once he gets going. When he’s not summoning the ghosts of the blues as a one-man-band, Steve is backed by a thunderous rhythm section of the legendary John Paul Jones (Led Zeppelin) on bass and Dan Magnusson on drums. At the risk of trying to sound too clever, You Can’t Teach An Old Dog New Tricks can best be described as a fun, rumbling freight train of music with about four different railcars to enjoy. You can choose from the laid back, almost dirge-like feel of songs like “Treasures” and “Burnin’ Up,” the mid-tempo blues shuffle of “You Can’t Teach An Old Dog New Tricks” and “Party,” the folky, acoustic sing-a-longs of “It’s a Long Long Way” and “Whiskey Ballad,” or the foot-stompin’, barn-burnin’ chug of “Days Gone” and “Back In The Dog House.” Seasick Steve handles the mood of each song with the prefect amount of emotion and musicianship. Foregoing discussions of technique and tone for ones of heart and feel, Steve plays these songs in every sense of the word. Getting down to the roots of what makes music so magical and conversational, Steve makes sure there’s something for everyone by keeping his music accessible and uncluttered. You Can’t Teach An Old Dog New Tricks has more than just good music though. Embodying the “old man looking back on his life” vibe, Seasick Steve’s lyrics contain moments of passing on things he’s learned along the way. This is most evident in songs like “What A Way To Go,” “It’s A Long Long Way,” “Treasures” and “Whiskey Ballad.” It may be true that you can’t teach an old dog new tricks, but when the old dog’s tricks are this good, there’s absolutely no need to.